For a time, I worked as a magazine editor for a couple of hobby publications. I dealt with plastic model kits, die-cast models, radio-controlled vehicles, model trains, books, board games—you name it. However, my favorite hobby genre was 1/32 scale slot cars. I recently took out my slot car set and quickly remembered how fun this hobby is! I began collecting 1/32 slot cars in 2005, and currently have 36 cars and a Ninco track (it's larger then the loop above). When I used to live in Wisconsin, I was even involved in a slot car racing league. Those tracks usually had four lanes, computerized lap counting, and full scenery. Really cool stuff and lots of fun—and very fast. Most slot cars can be modified for better handling and more speed. Modifications can include stickier tires, faster motors, stronger magnets, different gearing, and more. Most of mine are stock, with the exception of some sticky silicone tires on a couple cars. Some of the big names in the 1/32 scale slot car world include Scalextric, SCX, Ninco, and Carrera. All of these brands also make tracks, too. Prices generally start around $30–$40 for an analog vehicle; analog tracks start around $100. Digital slot cars have come out in recent years, but haven't caught on much. 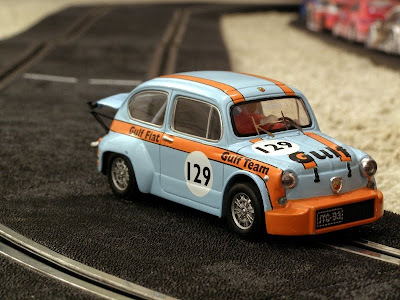 I wholeheartedly share your enthusiasm and am officially envious of your Gulf Fiat 500 Abarth!! 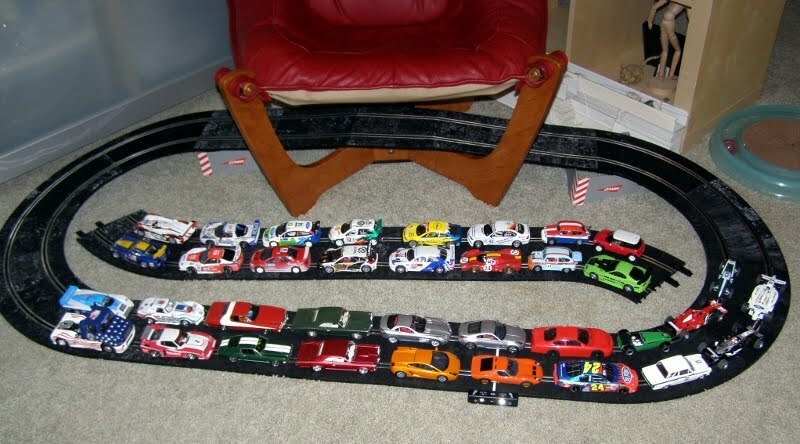 Slot cars are a great way to partake in one's automotive enthusiasm on a managable scale. My area of specialization is 1950s GP racing...so yes, Fangio, Moss, Schell, Hawthorn...all the greats are frequent visitors at my home track. There are some wonderful models available, and to be able to actually drive them at the limit is pretty cool. Totally agree, it's completely small town racing, big amounts of fun!